Toronto: Alfred A. Knopf, 2016. The Taming of the Shrew is a play within a play. In the mad rush to “Kiss me, Kate!” we leave behind and forget the two scenes of the “Induction,” in which a hoax is played on a poor sleeping drunkard, after which the whole merry company settles in to watch the comedy. Christopher Sly wakes to find all around him proclaiming him a wealthy man, the bald lie a neat parallel to Petruchio’s method of taming his wife-to-be by insisting that Katherina tell lies and proclaim the sun the moon. In her contemporary retelling of the play, Anne Tyler’s Pyotr requires no such absurd proclamations from Kate, though she does have to lie. There is no attempt to modernize the subjugation of a woman by her father or by her groom. I am a sucker for modern retellings of classic texts, and in that regard fairly easy to please, but Anne Tyler’s handling of the marriage plot is a stroke of genius. Dr. Battista asks his daughter Kate to marry his research assistant Pyotr Shcherbakov so that Pyotr can continue to live in the US and help Battista with his life’s work. A looming deportation because of an expired visa is the obstacle, the green card is the quest, and US Immigration is the unseen enemy. US Immigration is also the unseen audience for whom Kate and Pyotr must perform, yet another stroke of genius from Tyler. Here is the play within the play. Aware that they could be asked to produce evidence of real courtship and marriage, they have to perform and stage and record it. Tyler gets a lot of comic mileage from the awareness that they are being watched. With US Immigration, Tyler kills three birds with one stone: the quest for the green card is the premise for their lies, for their marriage and for their performance. Vinegar Girl takes its title from the saying “You can catch more flies with honey than with vinegar.” When Kate teaches him the saying, Pyotr wonders why a person would ever want to catch flies, and gives Kate the nickname Vinegar Girl endearingly. It’s a celebration of her prickly personality, a condemnation of the gender politics that make sweetness an attractive feminine attribute, and a welcome subversion of Katherina’s monologue at the end of Shakespeare’s play. Katherina is utterly changed at the end of the play, affirming a husband’s right to rule. Kate changes but is not tamed. At the beginning of the book, Kate is adrift and lonely and beginning to be bitter. She does not have a life plan, and the impact that this lack of direction has had on her self-esteem makes all the more believable her agreeing to marry Pyotr. It is, at the very least, a way to leave her father’s house. She is an indifferent housekeeper and cook at the beginning of the book and at the end, and this is exactly as it should be. Tyler’s Kate is not interested in making house or making nice, and she does not have to. She does not have to change in order for this marriage to do the work it has to do. And, while Shakespeare’s Bianca is sickeningly dutiful to her father, Tyler’s Bunny is a rule-breaker, a layabout and a poor student in need of hours of remedial tutoring. It’s this last aspect of the modernization of Bianca that is my only quarrel with Tyler’s book. Why make Bunny an airhead? She could have had swarms of tutors coming and going for gifted enrichment just the same…. But “gifted” is not where this book is aiming. This is easy and delightful reading. It’s clever and charming and fun. I loved every minute of reading it. I’ve been on rather a run of “in the style of” books lately. I don’t know that I’ve ever read much “fan fiction.” There was one, very terrible continuation of Pride and Prejudice that follows Elizabeth and Darcy into marriage. I read that and swore I’d never go down that road again. Val McDermid’s rewriting of Northanger Abbey was so clever, and Jo Baker’s alternate view of life below stairs in Pride and Prejudice was so compelling, though, that I am less and less afraid of venturing into fan fiction territory again. 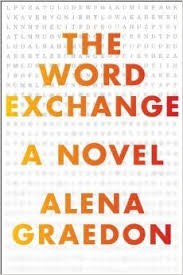 And really, let’s face it, there was never any question as to whether I would read a (contemporary) homage to P.G. Wodehouse, which is what Sebastian Faulks prefers to call his Jeeves and the Wedding Bells. The novel begins with a role reversal: Bertie Wooster is Bunburying again, in this case, pretending to be valet to Jeeve’s Lord Etringham. This, in itself, is a wonderful plot idea: to make the gentleman and gentleman’s gentleman relationship a bit more appealing to contemporary readers by putting Bertie below stairs, or on an uncomfortable bed up in the attic, as the case may be. 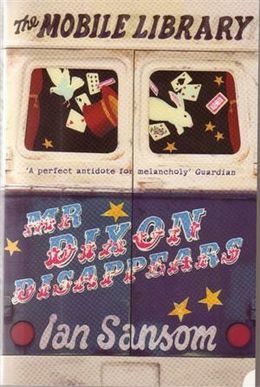 The story that follows is a fun and diverting read, true to the spirit of Wodehouse, if never quite measuring up to his ability to provoke belly laughs. To the old hands, meanwhile, I would say only this; that yes, I did understand the size of what I had taken on; and yes it was as hard as I expected. Wodehouse’s prose is a glorious thing; and there’s the rub. I didn’t want to write too close an imitation of that distinctive music for fear of sounding flat or sharp. Nor did I want to drift into parody. 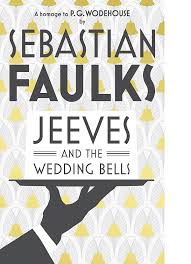 What I therefore tried to do was give people who haven’t read the Jeeves books a sense of what they sound like; while for those who know them well I tried to provide a nostalgic variation–in which a memory of the real thing provides the tune and these pages perhaps a line of harmony. The novel does not betray his struggle; it does provide the sought-for line of harmony. If I have anything with which to quarrel it is that there is too little of Jeeves, but then, I suspect, that is precisely the point. Send the people back to the original for more. There could be no wearing of clothes without their laundering, just as surely as there could be no going without clothes, not in Hertfordshire anyway, and not in September. Washday could not be avoided, but the weekly purification of the household’s linen was nonetheless a dismal prospect for Sarah. A far cry from “a truth universally acknowledged,” and more true to the spirit of Jane Eyre, which also echoes through this passage. Sadly for Sarah, the Bennets’ maid, there is every possibility that a walk will be taken that day, and that the ladies will return with their petticoats three inches deep in mud. 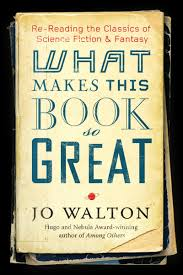 The book is full of the details of the lives lived around the events that coat petticoats in mud, around the glittering glory of the Bennet girls at a dance or a dinner: the hours of preparation and clean-up that go into the glitter. We learn that the velvet ribbon that trims the dress must be unpicked before every wash and then sewn on again so that the dye will not bleed. We learn that the housemaids had to coat their hands in goose fat to soothe the chilblains that were caused by all the washing of linens. Longbourn tells the story of Pride and Prejudice from below stairs, and we have the story (re)told in neat parallels. A James Smith arrives in the household at the same time that Bingley arrives at Netherfield Park. Sarah, like Lizzie, has two men to interest her. There is mystery and romance and an awful lot of lovely detail. Baker is marvellous at packing the novel full of sensory information: the sounds in the hedgerows in the early peppery-cold morning, foxes barking, the smell of spearmint, the pain of chilblains. he drew her along into the little wilderness, and they followed the path through the tangled dead grass. He lifted a low-hanging branch to let her pass. The rowans still had a few scarlet berries unpecked by the birds, and everything was hung with raindrops, and smelling of rot. Behind her, in her absence, the house was grinding along, its cogs turning and teeth linking, belts creaking, and there must come a moment–any moment now–when a cog would bite on nothing, and spin on air; some necessary act would go unperformed, some service would not be provided; the whole mechanism would crunch and splinter and shriek out in protest, and come to a juddering halt, because she was not there. Mrs. Hill (she always gets the honourific) is a kindly woman, scrupulously fair and trusting, but she wants none of this kind of hanky panky from her staff. She comes marching along to put a stop to what could easily have been a threshold moment for Sarah. Sarah, to her credit, is smart enough to weigh her options as far as the men go, and while the plot travels neatly along the lines of the original for the first two volumes, the plot’s twists open up considerably in the third. Wickham comes off decidedly less appealing than in the original. 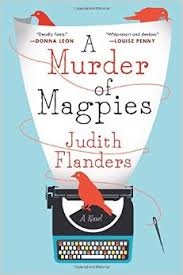 I was transfixed at how well and apparently seamlessly Baker shaped her novel in neat parings and echoes of the original. In addition to the lush detail about the house and its setting, I absolutely loved all of the information about life below stairs. I often find myself wondering who is doing the cooking in the finer fictional households, and this book gives all the details that we might desire. Baker also introduces into this retelling issues of race, slavery, class, inheritance, gender and homosexuality. Refreshing, to be sure, but a little forced if I am to be honest. I think that this book might have ticked fewer politically correct boxes and have been the stronger for it. That is my only quibble, and it is a small one. A delightful read. 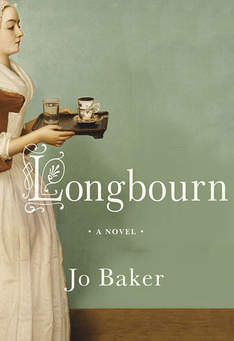 Longbourn is released in paperback this week.